Plane Pull for Sight is a fun, unique and family-friendly team-building event where teams of up to 20 people – friends, family, colleagues, coworkers – compete to pull a 60 tonne FedEx 757 cargo plane along a 20 ft. course, all in support of Orbis Canada. Check out some highlights from the 2018 Plane Pull for Sight to see what it's all about! Teams are required to fundraise a minimum of $2,500 for the opportunity to take part in this ultimate tug-of-war, and the chance to win some great prizes. Don't think you can gather a team of 20 people? No problem - there are always plenty of eager volunteers or members of other teams who are happy to jump in and help your team pull. Along with the pull itself, there will be a whole host of other fun games and activities for participants and their families to enjoy. A giant obstacle course, bouncy castles, face-painting and so much more! And, of course, one of the highlights of the day is always the Kids' Pull. But Why Pull a Plane? 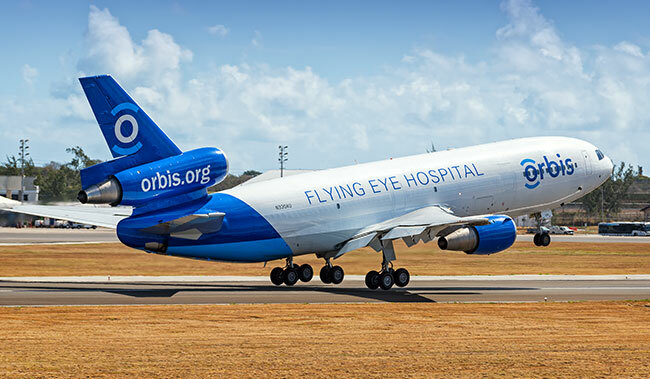 Orbis is a global non-profit organization that brings people together to fight avoidable blindness, restore vision and help ensure no one loses their sight to a preventable, treatable disease. Training doctors, nurses, medical technicians and other frontline eye health workers so they can save and restore sight in their own communities for generations to come. Strengthening and improving eye health systems by partnering with local hospitals, public health agencies and fellow NGOs to find sustainable solutions now, and for the future. Advocating to make fighting blindness a priority by working at local, national and international levels to demonstrate the economic and social benefits of a strong eye health system. Creating a permanent, united eye care community by eliminating geographical barriers and bringing together the best ophthalmic professionals to fight blindness and provide quality eye care for all.